Warehouses require ample space for storage and movement of heavy equipment, items in production, and the people who are employed to make and move those items. As the liason between manufacturers and customers, you play an important role in the pickup, storage, and transport of many goods and need an open space with plenty of room for shelving. The versatility of a warehouse is crucial to its successful operation. A custom pre engineered metal building is the perfect choice for your warehouse business, whether you are new to the industry or looking to expand. Steel buildings offer huge advantages over structures made of other materials, the biggest one being space. Because of the way steel is erected, you won’t have to worry about load-bearing columns and walls taking up the room that you need to store items and operate your warehouse efficiently. This is true for red iron steel buildings in particular. 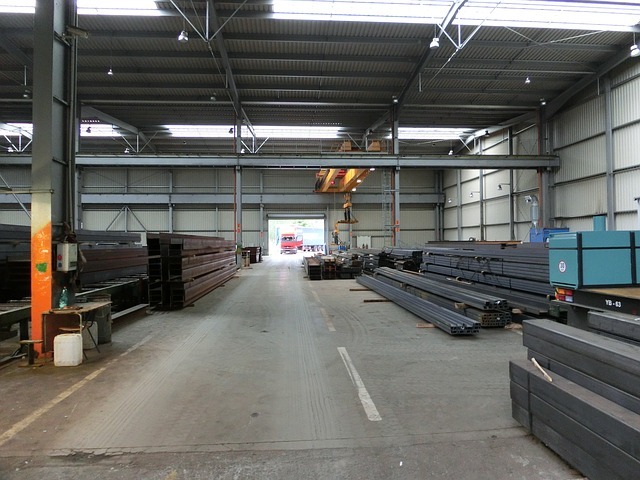 In fact, we highly recommend red iron steel for larger industrial buildings and warehouse applications. Our prefab steel buildings can be customized for your needs. No matter what size you’re looking for, we can accomodate a variety features and modifications to suit your business. If you need a solid structure that will stand the test of time and give you the freedom to grow, contact us today at (980) 365-6583 for a detailed estimate on metal warehouses. Why Use Steel For Your Industrial Metal Building? As mentioned above, steel offers a variety of advantages over other types of building materials, especially when it comes to warehouses. We use high-quality tubular steel in our smaller building projects, such as storage sheds and garages. For larger projects, such as industrial warehouses, we recommend red iron steel, because of its distinct benefits, which we’ll outline below. 1. Red iron steel warehouses are more spacious. Metal I-Beams are constructed to create a sturdy, rigid frame without the load-bearing walls or columns that other types of framing would require. This means you get a much more open space in which to store the necessary items and equipment needed to run your warehouse. You’ll be able to use the space much more efficiently without having to worry about annoying obstructions. 2. Metal warehouses are strong and durable. Steel is much more durable than other materials and is also rust-, fire-, and termite-resistant. It’s also designed to withstand the elements. Purchase a metal building from us, and it’s sure to last you for many years to come. 3. Industrial steel buildings are more economical. The materials you choose to build your structure will affect the overall cost. More and more business owners are turning to red iron steel for their industrial building needs, and for good reason! Our pre engineered buildings are designed to go up quickly, reducing construction time significantly. This provides you with the added benefit of lower start-up costs for your business. If you’re just getting into the warehousing industry, steel is the perfect option for you! And even if you’ve been in business for a long time and are looking to expand, we can provide plenty of add-on options, allowing you to take advantage of the budget-friendly convenience that steel buildings offer. 4. Metal warehouse buildings are customizable and flexible. We can help you choose from among the many options available to you, from the size of your building, to the exterior color and more! Not only that; your metal building is designed to grow with you, so if you’re just getting started in the warehousing business, and you need an easy future expansion solution, we’ll make sure you’re properly set up right from the beginning. We believe in doing things right the first time and will take your long-term needs into consideration, along with your current needs and budget. As e-Commerce continues to grow, so will the logistics solutions required to keep it thriving and keep online shoppers 100% satisfied. You need a solid warehousing solution for storing and transporting products to consumers. For the reasons outlined here, metal is a great choice for a warehouse building that will truly stand the test of time. ​Give us a call today at (980) 365-6583, or fill out the form on this page to begin the estimation process for your steel warehouse project! Want more info about industrial steel buildings in NC? Give us a call!